I think all optical illusions are interesting and fun, but some of my favorite illusions are depth illusions. These particular illusions catch my attention because no matter how long you stare at the illusion, it can never be figured out because there is actually no depth. The perception of depth creates for an easy way to maneuver around the world, and if depth is eliminated or decreased, everyday life would be difficult. I remember one time at work when I was making pizza too much flour hit me in the eye and I lost one contact. This in itself creates somewhat of a depth illusion, especially with vision as terrible as mine, and I struggled to make pizza and couldn't drive home. The pizza was hard to make because where I work we put the cheese down first and the sauce on top in a swirl pattern, and for some reason the swirling pattern was very difficult for me with one corrected eye and the other one my regular vision. 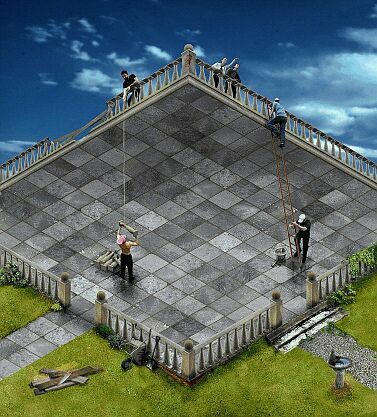 Here is one of my favorite illusions.